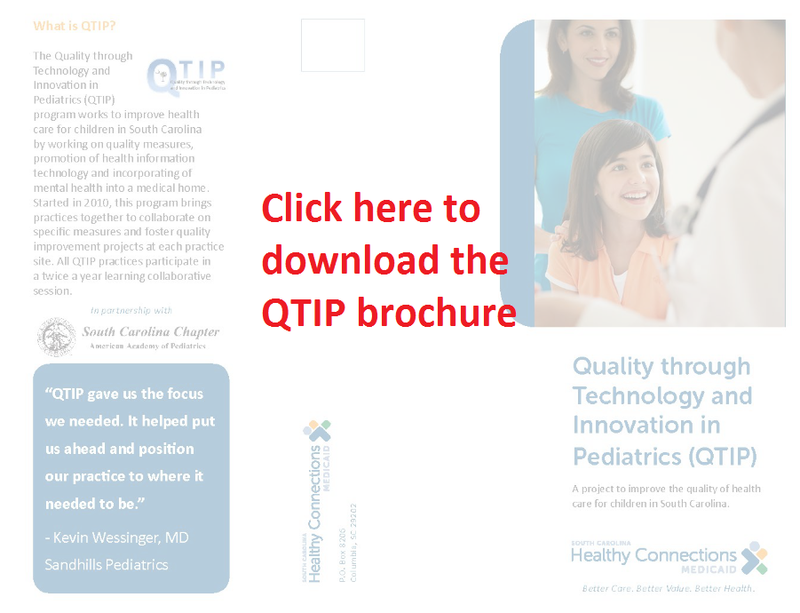 The Quality through Technology and Innovation in Pediatrics (QTIP) program works to improve health care for children in South Carolina by working on quality measures and incorporating mental health into a medical home. Started in 2010 under a CHIPRA federal grant, this program brings practices together to collaborate on specific measures and foster quality improvement projects at each practice site. At the conclusion of the grant in 2016, SCDHHS chose to continue many of the program's components. 4. To provide practices with the skills to become a patient-centered medical home (PCMH). QTIP represents a unique opportunity for South Carolina pediatricians to help develop quality improvement tools that will lead to better health outcomes for current and future generations of patients. Why should my practice participate in QTIP? How will Healthy Connections help? QTIP is a partnership between the SC Department of Health and Human Services and the South Carolina Chapter of the American Academy of Pediatrics. To participate, each practice will identify a quality improvement team consisting of a lead practitioner, nurse, and office manager to implement the quality improvement efforts within the practice. Practices will be required to attend semi-annual Learning Collaborative sessions which will coincide with the South Carolina Chapter of the American Academy of Pediatrics meetings. New practices may apply at any time; however, QTIP will formally begin working with new practices in January of each year. Due to staff and resource availability limitations, QTIP will restrict active participation to 30 practices. To learn about QTIP's fluoride varnish training, click here.